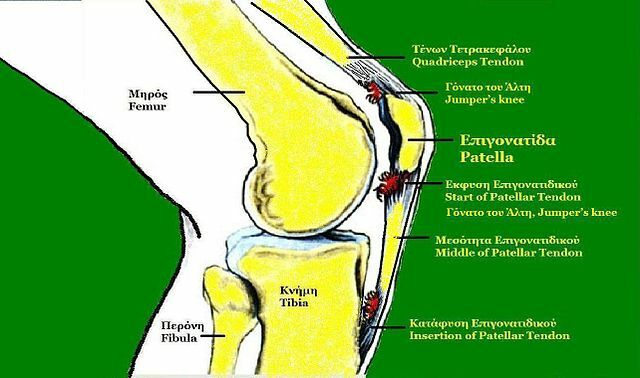 Patellar tendinitis or ‘jumpers knee’ is a condition that results from an inflammation of the patellar tendon. The patellar tendon is the structure that connects the patella (knee cap) to the tibia (shin bone). Taking a closer look at anatomy, the knee cap is a small floating bone (sesamoid bone) which attaches the quadriceps to the tibia through the patellar tendon. Hence the patellar tendon being a continuation of the bulky quadriceps muscle is pivotal in the way you move your leg. It helps the quadriceps muscle extend the lower leg so that you can kick a ball, jump in air or push the pedals on your bike. The commonest cause of jumpers knee is overuse. This occurs frequently in jumping sports such as basketball and volleyball and hence it is often referred to as ‘jumpers knee.’ However it can occur with sports such as running and soccer too. A less common cause is due to direct injury to the tendon. The symptoms of patellar tendonitis are pain and occasionally a swelling over the patellar tendon. Pain is usually sharp during the sporting activities such as jumping or running and persists as a dull ache after the activity. Initially the pain might be present only during the start or after completing the sport or work out which then worsens to becoming more constant in nature. Everyday activities such as climbing up and down stairs might be painful too. Pain on pressing directly over the patellar tendon is a characteristic feature in examination. An X-ray might provide additional information of a bone spur and an MRI is needed in more chronic cases to rule out tendon degeneration. If the symptoms persists beyond 6 months after attempting conservative treatment then surgery can be discussed. There is little research available on the best surgical options for patellar tendonitis so the procedure depends largely on the surgeons discretion.